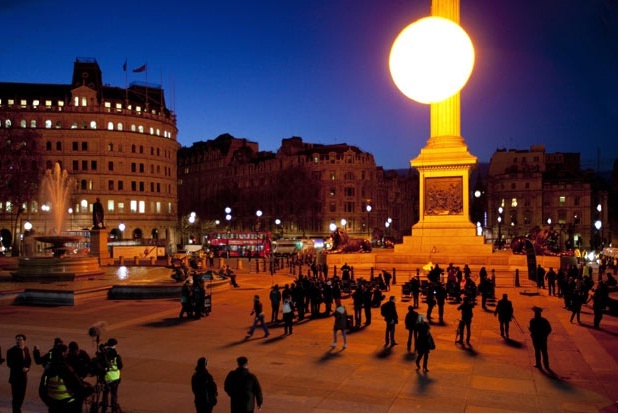 At 6.51am on Monday, juice brand Tropicana launched a huge sun installation over Trafalgar Square, suspended from Nelson’s Column. The sun weighs more than 2,500kg and took six months for art company Greyworld to create. At 30,000 times the size of a football, the sun produces the equivalent of 60,000 lightbulbs: 4-million lumens of light. The stunt was managed by Freud Communications as part of Tropicana’s ‘Brighter Mornings’ campaign. More than 35,000 cartons of juice were handed out, with passers-by encouraged to take pictures from designated photo points and watch the sunrise from Tropicana deckchairs with branded sunglasses and blankets. Had the pleasure of seeing this face to face Monday morning. The ‘sun’ did look truly extraordinary and attracted attention from everyone in the area. Felt for them a bit when the Evening Standard covered the story but didn’t credit Tropicana – so annoying when that happens!